The author bags one of the many lines on the Gran Sasso Massif. 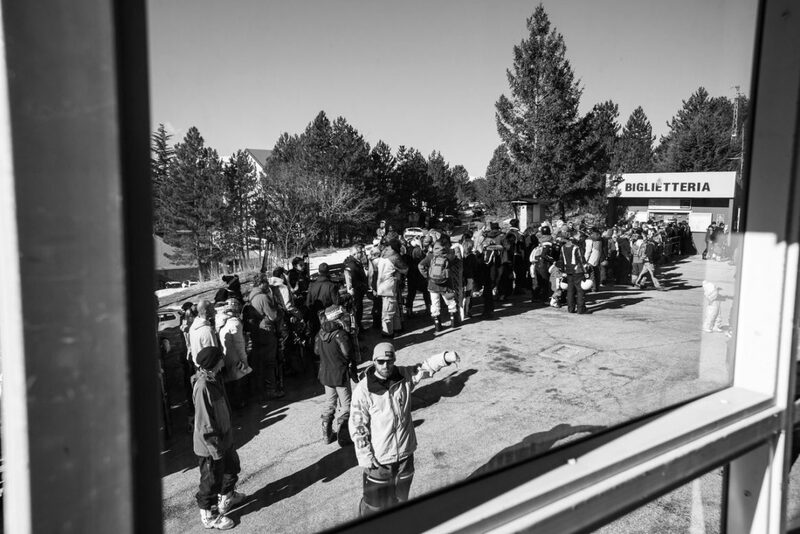 This article has been adapted from the Winter 2018 print issue of Downdays magazine. Use the mag finder at the bottom of this page to find your copy. 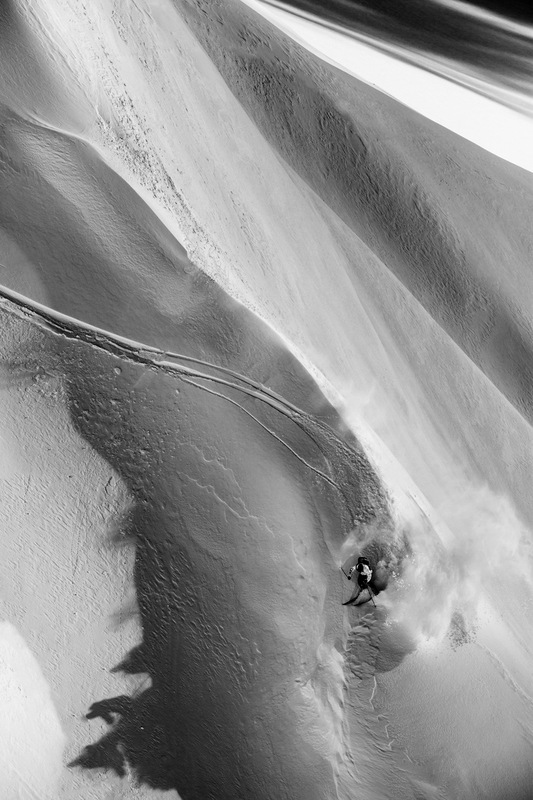 Flashback to February 2015: We’re far from home search of powder—in Japan to be exact. It’s warmed up unexpectedly, and after an unsatisfying ski day we all stare resignedly into our smartphones. Back home in Europe a stunning new snowfall record has just been set: 256 centimeters in only 18 hours! But no “epic pow day” photos are to be found in our friends’ social feeds. It turns out the town of Capracotta, where the record was set, isn’t even in the Alps; it’s east of Rome, in the Abruzzo region. And so, in the middle of the powder El Dorado of Japan, the idea of paying a visit to central Italy is born. A preliminary mountain-bike visit to Abruzzo in the summer of 2015 confirmed our suspicions: even in July, the highest peaks and cirques of the region were still covered in snow. 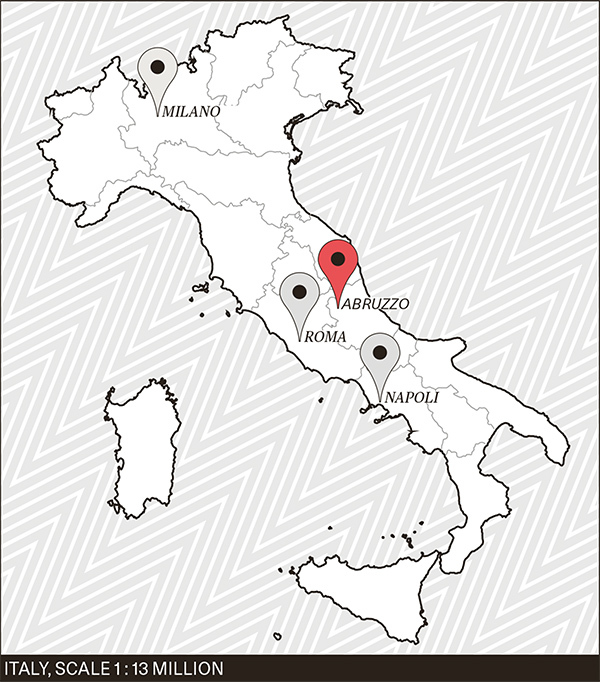 The topography of the central Apennines is similar to that of the Alps—only with an Adriatic view. We had to come back in the winter; that much was clear. Why is this beautiful, pristine region near Rome practically unknown as a destination in skiing circles? I believe that the Alps present a certain imaginative impediment to us central Europeans. After all, we’ve got everything we need right here at home. People love their habits, and change them only when unusual circumstances demand a reorientation. Circumstances like three bad winters in a row in the Alps, for example. But somehow, and I’m no exception here, our alternative options bounce off the Alps and lead us directly to the nearest airport, from whence we jet to the last real snow-secure regions of the world—to Japan or North America. But time constraints meant that this wasn’t an option for us in 2017. The news of a dramatic avalanche brought our attention back to Abruzzo. There, where wolves and bears still bid each other good night, winter was apparently in full effect: a two-meter base and snow down to low elevations. Flo Geyer rides one of the "Alaska spines" above the Campo Imperatore plateau. It was easy for us to leave the Alps in February 2017, with no snow until the Brenner Pass and rain in the forecast. We, the modern climate refugees Flo Geyer, Torge Nagel, Flo Breitenberger, my brother Marinus and myself, loaded up our RV and pointed it south. Around Rimini it began to rain, still three hours away from our destination. Had we really made the right decision? The sprawling alpine plateau beneath Campo Imperatore. The next morning brought certainty: we were right on the money! 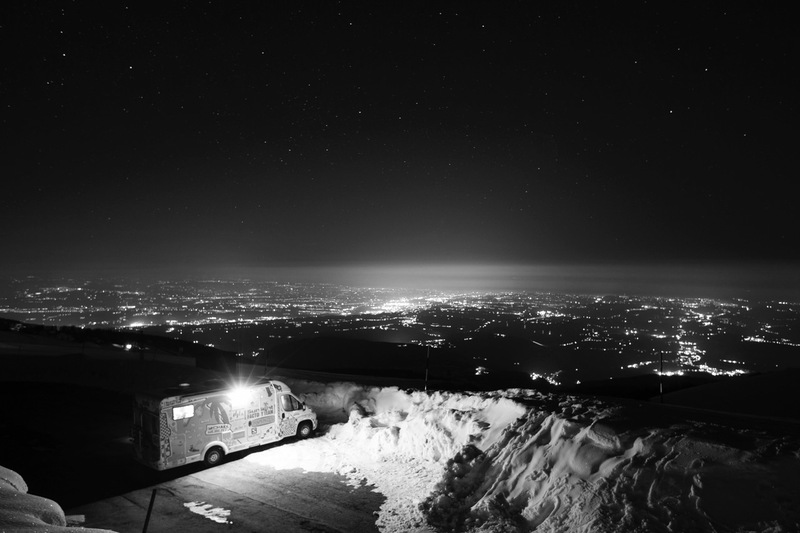 Beyond the windows of our RV in Fonte Cerreto at the foot of Corno Grande—the highest peak of the Apennines at 2,912 meters—a light snowfall abated and the clouds broke to reveal a view of the enormous Gran Sasso massif decked in fresh snow. We took the first gondola up to Campo Imperatore at 2,130 meters, tore across the small, deserted ski area, and enjoyed 30 to 50 centimeters of powder on a solid base, for the first time of the season. Abruzzo had us under its spell. The weather gods were playing along. 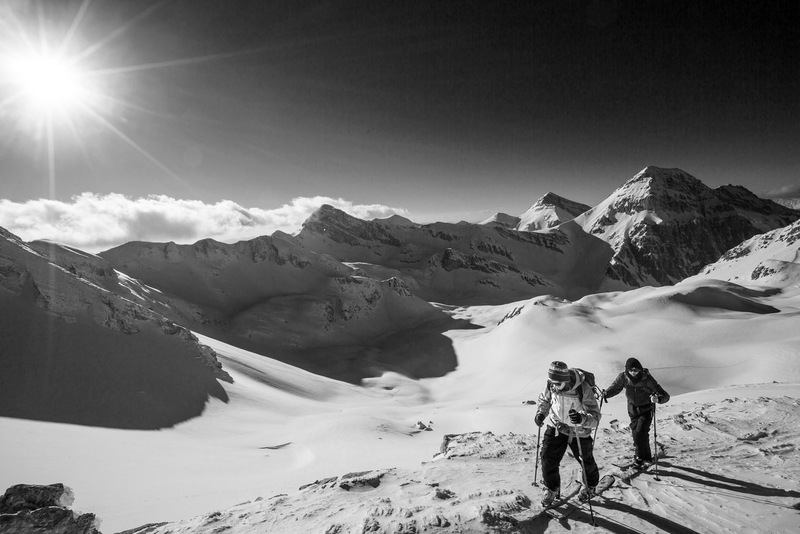 Flo Geyer and Torge Nagel return from a good day in the deserted back bowl behind the Rifugio Duca degli Abruzzi. For three days we explored the high plateau of Campo Imperatore. One ride on the gondola costs five euros; although the ski area with its two lifts, doesn’t have a whole lot to offer. But things look different when you ascend with skins to the Rifugio Duca degli Abruzzi at 2,388 m and discover the back bowl: completely alone and freed from the trappings of civilization. We scaled several faces and were continually surprised by the perfect conditions. The highlight at the end of the day was the descent down the avalanche path back to Fonte Cerreto, where our mobile home stood waiting right at the end of the run. This winter the avalanches thundered down the Grand Sasso massif with unbelievable intensity; avalanche debris lay meters high in the yards of many of the houses. Incredibly, the people of Fonte Cerreto were spared from tragedy—unlike on the other side of the massif, where in January 2017 a huge avalanche buried an entire hotel and claimed nearly 30 lives. On our last day in the Gran Sasso national park, we skied down the sprawling high plateau beneath Campo Imperatore, where an idyllic lake pleases day-trippers from Rome in the summertime. Already on our first day we’d spotted some impressive spines on the east side that seemed to beckon us hither. The ascent was long but beautiful, up a ridge to the highest point. All of a sudden we were swallowed by a sea of fog. The group was now out of visual contact. Flo Breitenberger and I kept climbing; now and again the clouds parted to reveal the distant Adriatic. At the top, we sat next to each other in the fog. No sign of Torge, Marinus and Flo Geyer. Primed in the start gate—me strapped onto my skis, Flo with the camera—we waited until a brief window of sunlight allowed for a descent. Suddenly it was there: a light breeze whisked away the tattered clouds, uncovering blue sky. A dream! Down below I could see Marinus, Flo and Torge on the ridge. Thumbs down: a weekend invasion of Romans at the Campo Imperatore gondola. A bit later, after they too had skied down one of the many available lines and we all met up on the huge plateau, it became clear why the three had fallen behind on the climb: Marinus’ skins had decided not to stick to his bases any more. Geyer’s touring binding was broken and only worked in downhill mode. And suddenly we were plunged into high-alpine reality: the ascent back up to the ski area was no longer an option. From our previous trip in the summer, we knew that a road led back down to the village—23 kilometers away. We felt our way through the fog from marker to marker, the road buried in white. As darkness fell we finally arrived, exhausted but satisfied, at our mobile home, where warmth, comfort and pasta awaited us. The Gran Sasso massif had done us well: we had regained our trust in winter, in its beauty and endless possibilities. But it was time for us to move further south to the Majella National Park, which we’d also visited in summer. 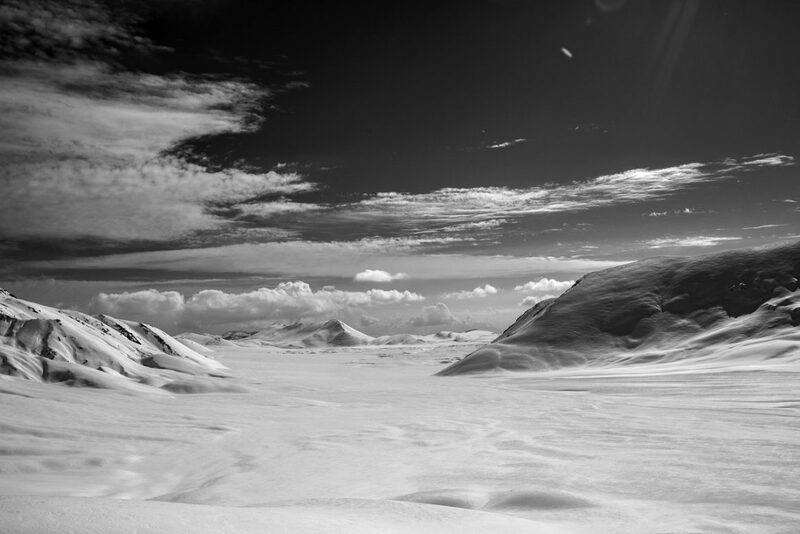 The plan was to ascend to the Carlo Fusco bivouac hut, to discover new terrain in total isolation and seclusion. The thousand-meter ascent was as long and difficult as expected, especially for Flo Geyer, who hobbled his way upwards in his locked-out touring binding. The rest of us fared little better, laden down as we were with heavy backpacks, sleeping bags and food for two days. Upon arrival at the bivouac, an incredible evening vibe and Adriatic views more than made up for our troubles. Our accommodation for the evening was a yellow metal can, buried deep in the snow at 2,455 meters elevation underneath a ridge. Few people find themselves in this place in the wintertime. The ascent is long, a constant up and down across increasingly steep and rocky terrain—no pleasure in the descent here. But beyond the bivouac one of Europe’s most pristine national parks, a skier’s paradise, lay before us: slopes in all expositions, chutes, cliffs, a solid base and 30 centimeters of powder lit up yellow-gold and untracked in the evening sun. The night was close and cold. Water dripped down persistently from the tin roof into our faces. A bottle of wine would do wonders right now — why did we leave it in the RV? 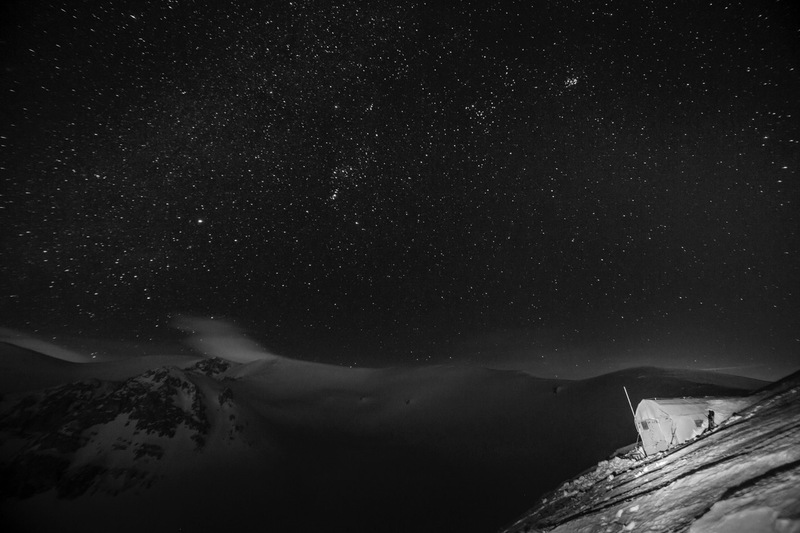 Swallowed whole by solitude: a night in the Carlo Fusco bivouac hut at 2,455 meters. Okay, who forgot to bring the wine? As we opened the door to the Majella massif and greeted the new day with its first warming rays of sun, the torturous night was quickly forgotten. We stuck our skins onto our skis and climbed with easy steps the last few hundred meters of vertical up to the peak. On top at 2,793 meters, we paused for a moment to admire the incredible places that skiing brings us to: the metropolis of Rome to the West, the Adriatic to the east, and below us a gentle slope coated in powder—unforgettable! 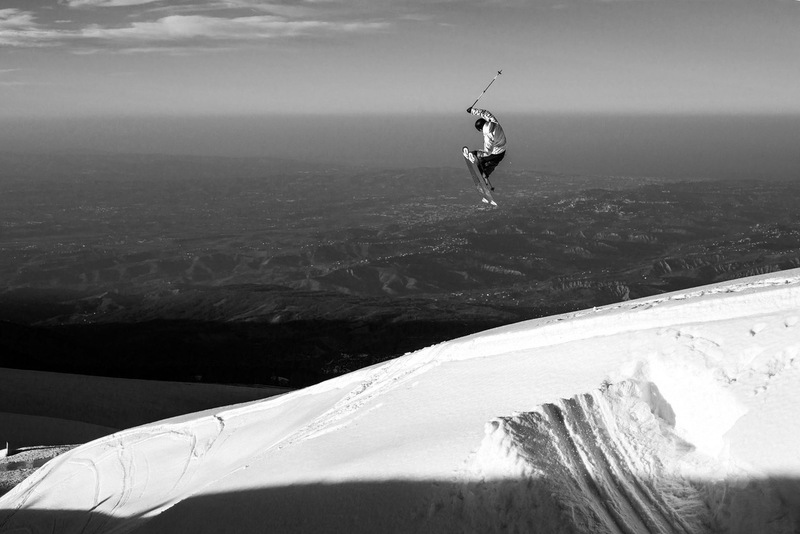 We chose the direct line back to the bivouac—no adrenaline kick or jumps, only big, sweeping turns and pure enjoyment. Back at the RV, with one day left on the trip, spring was making its first marks, even here in Europe’s current powder haven. It got warm, and the powder quickly turned to slush in the central Italian sun. We spent the day with kicker sessions, jibs and cappuccino—and celebrated the end of this special trip in our comfortable mobile home, with meter-high snow walls outside the windows and below us, quite close, the Mediterranean. Bella Italia! Skiing with Adriatic views: Flo Geyer on a hip in Majella National Park. Dear Abruzzo, we’ll be back. Remaining in memory is not just a perfect ski trip with powder, sunshine and the best crew; no, other impressions linger, ones not so easily collected in the Alps. We puzzled over strange markings in the snow that later proved to be bear tracks, felt the “dolce vita” with vino and pasta, and enjoyed life beyond the beaten paths of the Alps. Between the snow and the sea: base camp at Majella.